Having been in the grips of a big snowstorm here in Jersey – the biggest storm in 30 years! We have are going into our third day of closed schools and I am feeling rather frazzled having had two girls pretty much housebound for the whole time! Don’t get me wrong, we love to play in the snow, but having spent about 20 minutes getting into all the layers of clothes, it is so very windy and cold that the girls only really last for half an hour so there are plenty of other hours left in the day for them to be looking for something to do! 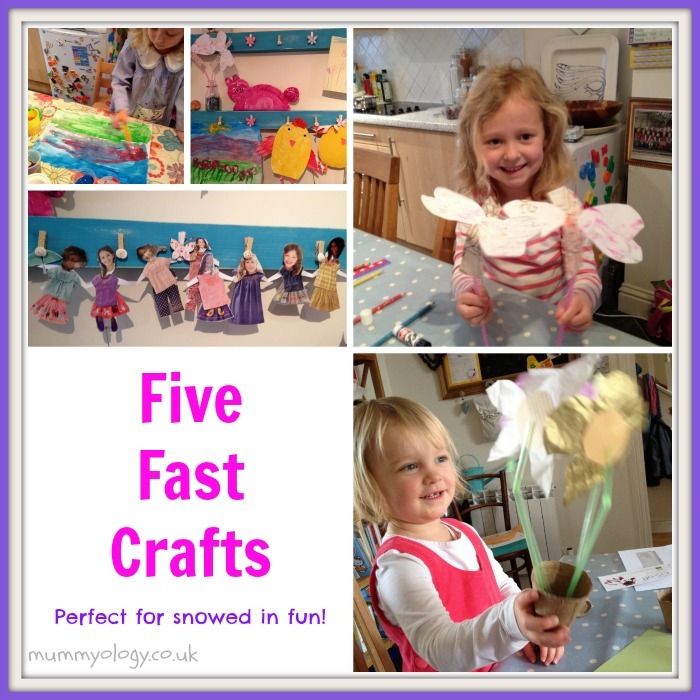 They are really good at playing together but there is something about having to play inside that makes it all seem a little less enjoyable so I have been busy trying to come up with some fast play fun to keep them busy and happy and to stop my house looking like it has been burgled! Here is what we have been up to so far…. With Spring supposedly coming soon (it was 19C three days ago and now we are knee deep in drifting snow!) I thought we could at least make inside look like Spring had Sprung! Freya absolutely loves doing craft and Bea who is in her first year at school obviously gets quite a lot of crafting time and wasn’t interested in joining us for this one but I think bigger kids could really go to town making more elaborate flowers and doing most if not all of the cutting out themselves. Freya is actually quite good at cutting out for a 2.5year old but to be fast (which was what we were after) I cut out the centre of the flowers – just a circle of coloured card, or something like this pretty paper I had. I then cut out circles and petal shapes in all sorts of different coloured tissue paper. Then I handed over the reigns to Freya and with very little help she totally knew what she wanted to do and where the petals should go. She LOVES to match colours together in anything we do so it was really interesting watching her pick out her petal colours. Once she was done, I simply cut a slit into the top of a straw and slid her flower head onto its straw stalk. Ta da! 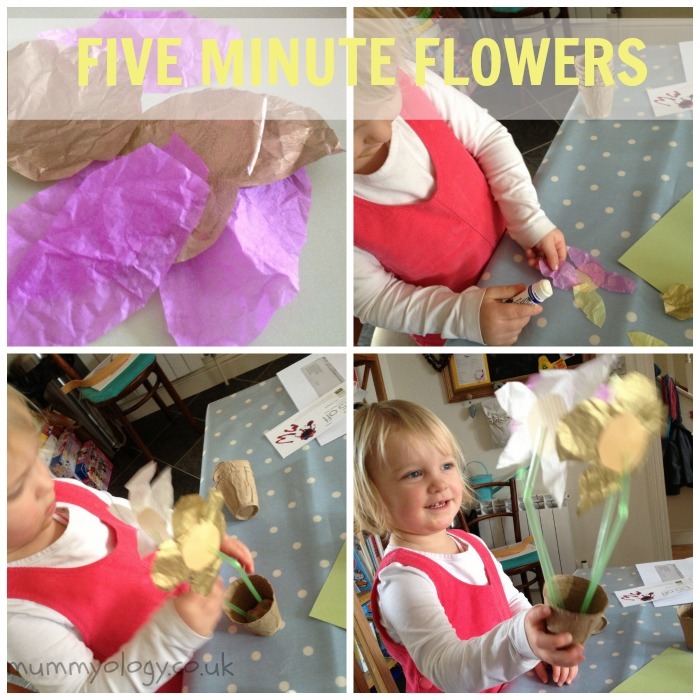 Superfast and really cute paper flowers. 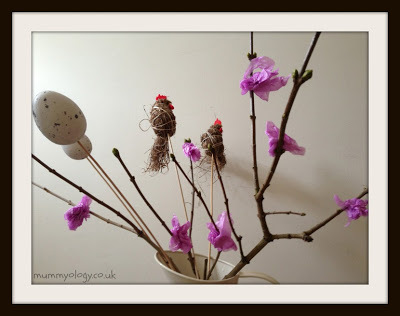 I had also seen some gorgeous blossom stem on Martha Stewarts website and thought we would have a go at making some ourselves and it is probably THE quickest and cutest craft I have done for a while. I simply chopped a couple of branches off a tree from my little garden and Freya and I scrunched up bits of pink tissue paper. 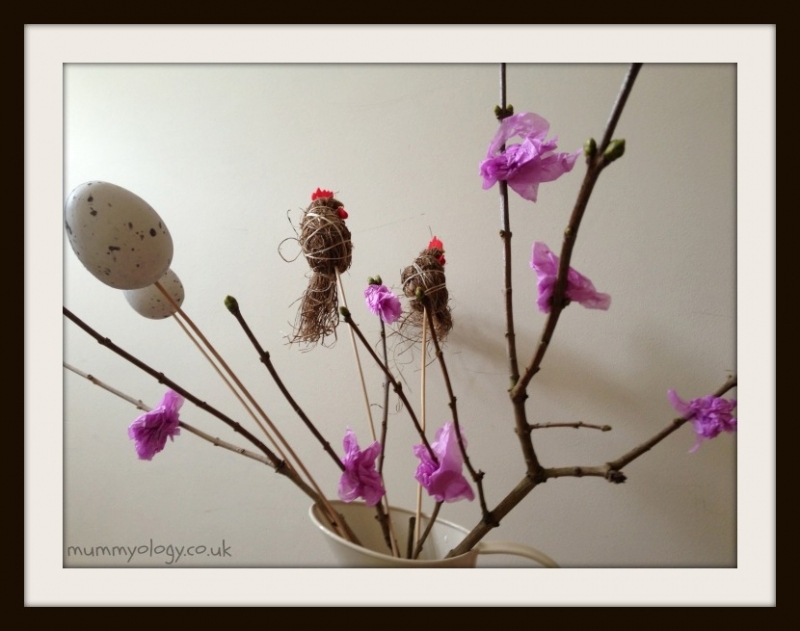 We then wiped the scrunched bit over the top of a glue stick and stuck them onto the branches. They look lovely as a centre piece on my kitchen table and if you don’t look too hard, they actually look quite real! As Bea has grown in confidence the longer she has been at school, I have relished watching her growing obsession with colouring neatly, writing on pretty much any bit of paper she can get her hands on and more recently, for making stuff. She has inherited my love for ‘recycling’ TP tubes and is often found decorating and sticking together tubes with the mini sellotape she got in her stocking at christmas! Anyway, this morning as I cleared the breakfast stuff away, she was busying herself and asking me to help her tear the sellotape for her. It was only when I stopped and asked what she was doing that she showed me her beautiful butterflies! She had found some glittery paper hearts we had made for Valentines day, cut a strip of paper for the body by herself and glued their heart shape wings on. The sellotape was for sticking the little butterflies onto straws. Just like that, my little nearly 5 year old had made her own craft project! She was flying them all around the kitchen singing away so I had to help Freya make some of her own and my little fairies spent a happy little moment that morning flapping their flutterbys around. 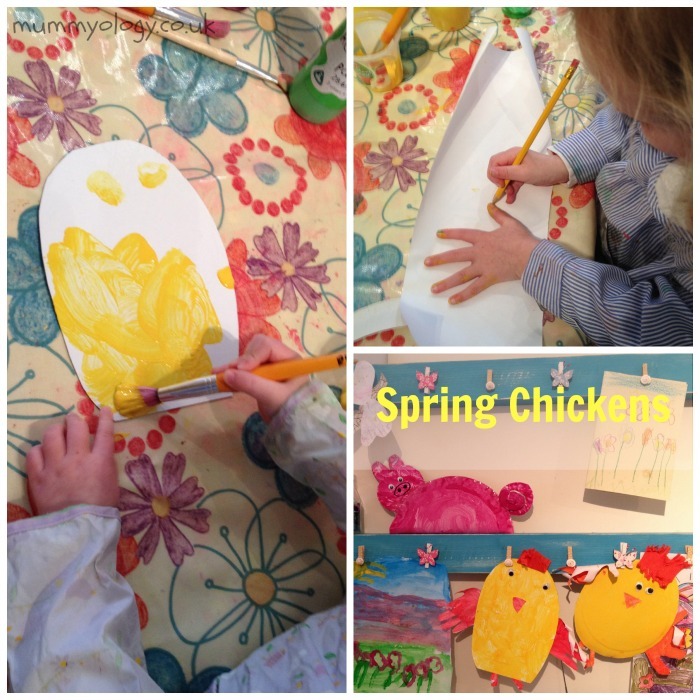 Both girls wanted to get the paints out so, continuing the spring theme our kitchen is adopting, we thought it would be fun to make some Easter chicks. 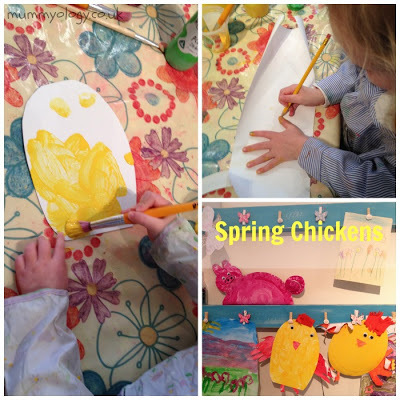 There are loads of ideas out there all pretty similar so we just followed suit and made some simple paper plate chicks. I cut an oval shape for Freya and Bea cut her own using the centre of the plate. The girls then painted them with some lovely yellow paint. Whilst we were waiting for this to dry, we drew around their hands onto some paper and painted the handprints orange. These will be cut out and used as wings. I also used some of the painted paper for cutting out beak triangles and little legs. Once the bodies had dried we glued on the eyes and the ric rac paper we had for the Chicks comb and its hand print wings – they are really cute little chicks! As I have said, Bea is quite my budding artist. Watching her skills develop is lovely and I thought our snow house arrest would be a lovely time to help her learn something new. She started adding sky to her colouring in and paintings in a typical line of blue at the top of the page so we decided to learn about using a colour wash of paint. Its very easy – simply paint your colour along the top or bottom of your page depending on whether you are doing sky / grass / sand. Then, dip your paintbrush into a pot of water and using this wet brush, wash the colour down your page. The colour fades a little creating a nice horizon line between colours. Bea even decided she wanted to make a sunset to added red on top of her sky before she did the grass line. The only tricky bit with doing a nice colour wash background is having to wait for it to dry before adding any detail on top! We managed to just about wait long enough before adding a sunshine, flowers and the obligatory princess…. This one does require a bit of forward planning but not too much time! It is my favourite craft of the week. Have you read Paper Dolls by Julia Donaldson? Like many of her other books, it is just lovely and has become an absolute favourite of my girls. I have also given it to friends children for gifts as I think it is a lovely story, telling the tale of a little girl and her paper dolls. They go on lots of lovely adventures together and one day are destroyed by a nasty boy and his scissors but; thankfully, they live on in the little girls memory with other lovely things she remembers (its a really lovely ending). 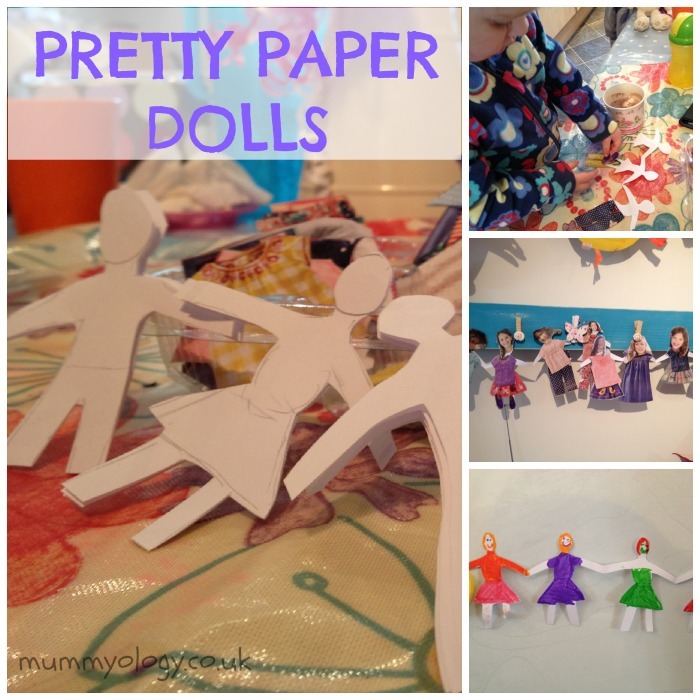 Since the first time we read the story, Bea has been badgering me to make some Paper Dolls. I really did have no excuses this time as we had nowhere else to go! 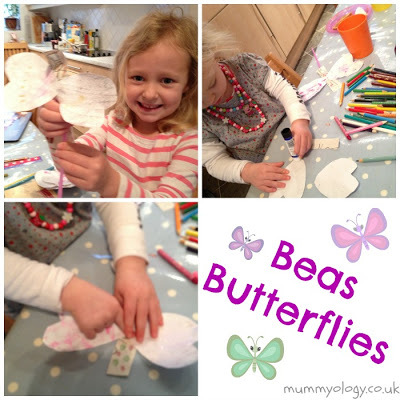 Both the girls enjoyed this one which is always satisfying in a craft! I pre-cut the dolls – boy ones and girl ones to make it easier for them both to get involved straight away. I knew Bea would love simply colouring in her little dollys and recreating her own version of the story. For Freya though, who gets easily bored with colouring at the moment, I cut out loads of pictures of clothes from a catalogue I had lying around. This was a bit fiddly for me but didn’t take long! Freya LOVED picking through the clothes, choosing what she thought were matching outfits and carefully sticking them on. I also cut out little faces for her and I think the finished paper dolls looked really fun. I will definitely be doing this again and think Bea will join in with the sticking next time! If you don’t want to cut out paper dolls, we have in the past just stuck outfits onto stick men simply drawn onto paper. I think it is quite a good way for them to learn what clothes go where and even what matches what… I live in hope that it will be reflected in their own real life clothing choices! We’re reading Paper Dolls right now for the Virtual Book Club for Kids! Love that book. Great list of ideas you’ve put together! Some great crafts – and hopefully you will get some nice weather soon!